All Emerson College staff and faculty have expanded access to the Adobe Creative Cloud software suite. Your license for Adobe is tied to your Emerson credentials, meaning you can install the full Adobe Creative Cloud suite on both your Emerson-owned and personal devices. This includes all laptops and desktops running Windows or Mac OS, as well as iOS and Android devices. For non-Emerson-owned devices, be sure to check the system requirements of your computer before downloading to ensure the programs can run. Keep in mind, you can only have two devices simultaneously licensed through your Emerson login, but you can easily switch the licenses between devices by following our instructions below. Please note: If you plan on utilizing the Adobe Creative Cloud suite in the labs or classrooms for any of your projects, you will not be prompted to log into Adobe. If you need to access files in your Adobe Cloud Storage account while in a computer lab or classroom, you may log-in, but please remember to log-off the computer at the end of your session which will reset the software license for the next user. What do I get access to through the Adobe Creative Cloud suite? The software is already installed on my computer. How do I sign in? 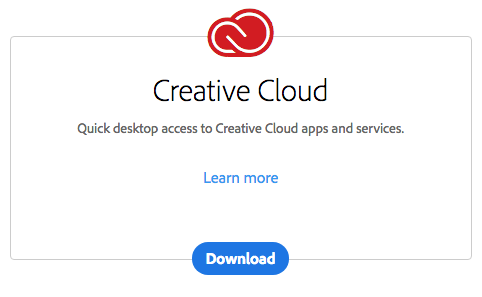 How do I download and install the Creative Cloud Apps? How do I add or remove a computer's access from Adobe Creative Cloud? Why do I only see the option for a Free Trial when installing the software? What versions of the Creative Cloud are running in the computer labs or classrooms? For a deeper look at everything you have access to through your Adobe Creative Cloud account, you can visit accounts.adobe.com and click on View Plan. Open any Adobe application on your computer. When the application opens, a window will pop up prompting you that a sign in is required. Click on the button Sign in Now and you will be directed to a new window. On the new window, enter your Emerson email address. The page will refresh and prompt you to choose an account type. Select Enterprise ID. You will be redirected to the Duo authentication page to complete your sign-in. Enter your Emerson username and password to sign in to your Adobe account. Once you've logged in through Duo, click Continue on the next page and the original Adobe application you started up will now open. You have now licensed all of your Adobe Creative Cloud applications on your device. Open a web browser (Google Chrome, Firefox, etc.) and visit adobe.com. Click Sign In at the top right of the page, and then click the blue link 'Sign in with an Enterprise ID'. Enter your Emerson email address and password. Choose Enterprise ID (company or school account) if you are presented with a choice. You will be directed to the Duo authentication page to complete your sign-in. Enter your Emerson username and password to sign in to your Adobe account. On the main page, you should see a black box with several menu items. Under the Creative Cloud Apps click on the link Desktop Downloads. You will see the apps available as you scroll down the page. Click the blue button underneath that says Download to begin. Find the installer that you downloaded in your Downloads folder and double-click to install. Once you've downloaded the Creative Cloud application, follow our instructions to sign in. After you've signed in, you'll be able to install all of the available Adobe software straight from the Creative Cloud application. A computer is activated everytime you log into the Creative Cloud application. If you do not have the Creative Cloud app installed on your machine, please follow our instructions on adding it to your machine. Please remember you can only be logged into the Creative Cloud on two devices simultaneously. To deactivate a computer, start the Creative Cloud application and click on the circle icon in the top right of the window, next to the bell icon. Click Sign Out. You are now signed out of the Creative Cloud and have released the device from being licensed with your Adobe account. You will also be prompted to deactivate a device if you try to log into the Creative Cloud with two active devices. If you select Sign me out of the other computers so I can sign in here, you will be logged out of the Creative Cloud on all of your active devices. We recommend selecting this option if you do not have access to your devices to log yourself out. If you want to select I signed out of one computer so I can sign in here, you first must log out of the Creative Cloud on one of your two active devices. To log yourself out of the Creative Cloud, open any Adobe application on your device, select Help in the top left of the screen, then Sign Out (firstname_lastname@emerson.edu). If you only see a Free Trial Option when downloading and installing your software, your computer may be signed in with a free, personal Adobe account instead of your Emerson one. To fix this, open any Adobe application and select Help > Sign Out. Now you can sign back in with your Emerson email address, selecting Enterprise ID when prompted. It's possible to have a free, personal Adobe ID that uses your Emerson email address in addition to the Enterprise ID provided through Emerson College. For more information on how this works, see Adobe's guide on ID types. If you have any questions about software versions or compatibility issues in the computer labs or classrooms, please reach out to helpdesk@emerson.edu.